Tonight on The Walking Dead, it’s all about bringing people together. 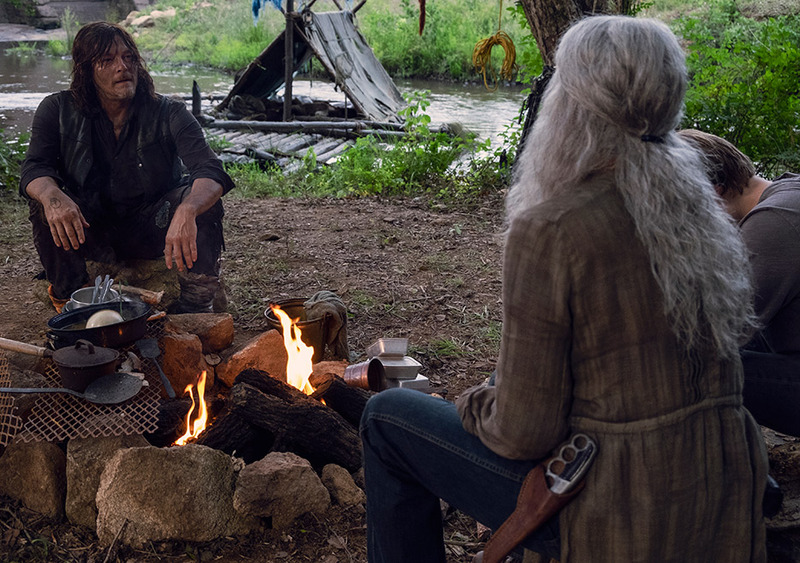 The plot: At Daryl’s woodland camp, Carol and Henry stop by for a night on their way to Hilltop, but Carol has an ulterior motive: she wants Daryl to come with them, both to get him out of his solitary life in the woods and to have someone she trusts looking out for her son. He is reluctant, and has long been looking for Rick’s body (which was obviously never found), and Henry is resentful of the idea of a chaperone. But a nighttime crisis of the two men saving Daryl’s dog (named Dog) and one another from some walkers changes both their minds, and it’s heavily implied that Carol manufactured this scenario for exactly this reason. 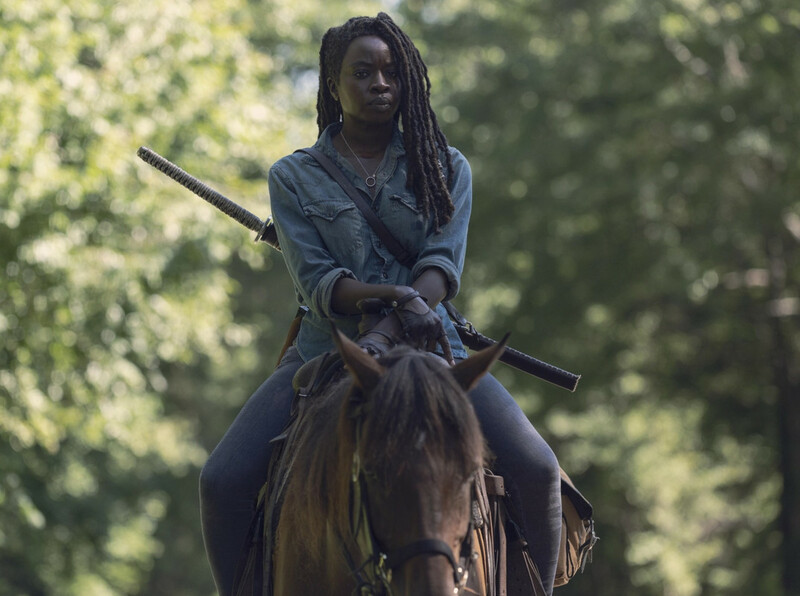 Elsewhere and also on the road to Hilltop, Michonne is still reluctant to trust Magna and company, keeping their weapons from them, and admits that she isn’t planning to go all the way to Hilltop with them. They come across the ruined remains of the group’s camp, including a collection of instruments, and make camp not far in some empty buildings for the night. Overnight, Luke finds a prized possession, an original Stradivarius violin, which Michonne destroys in her paranoia. They talk about what brings people together to survive, and later work together to kill the small herd that took out the vamp, which includes putting down their turned friend Bernie. 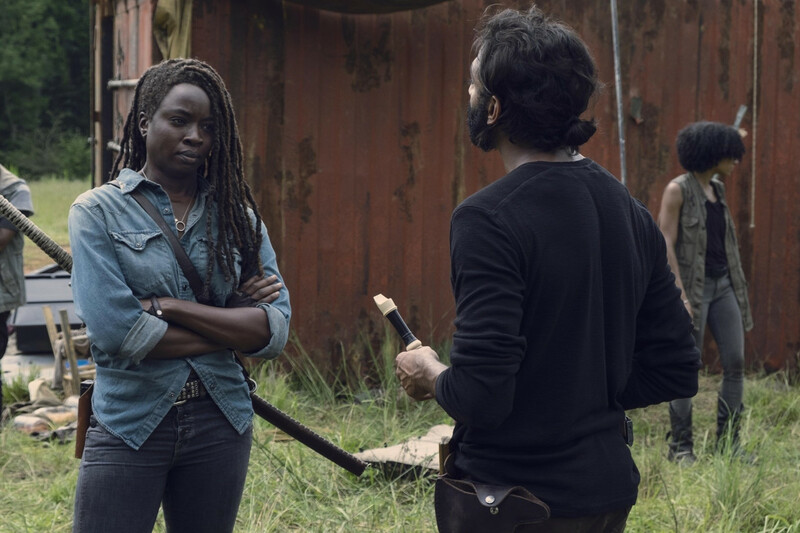 Michonne opens up some to them from this, but even hearing Maggie is gone won’t get her to Hilltop until she learns that Rosita is there after being found, injured. Finally, at Hilltop, we learn that Maggie has indeed left with her son to join Georgie’s crusade, leaving Jesus in charge–although he’s now been freely elected more than once to continue on as leader of the community. Not a position he loves, however, as he makes frequent trips beyond the wall to meet and train with Aaron, and keep information flowing between them. Alexandria isn’t currently planning to be a part of the Kingdom’s upcoming fair. It’s the two of them who find Rosita, exhausted, injured, and passed out, and bring her back to Hilltop to be treated. 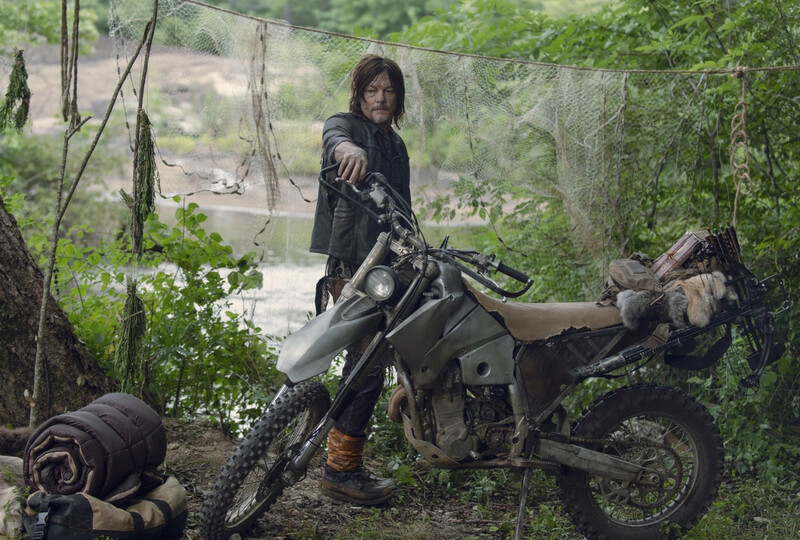 By the end of the episode, Daryl (and Dog), Jesus, and Aaron head out to look for Eugene. We’re learning little bits of information about the last six years as the show goes on. Tonight’s revelations include that Maggie has been gone for a considerable stretch of time–long enough for Jesus to have been reelected leader of Hilltop in her absence, which to me implies it’s been a few years now. And yet, Michonne not only didn’t know this, she didn’t want to go to Hilltop because she didn’t think Maggie would want her there, didn’t know what she would do if they saw one another. The last time we saw Maggie and Michonne, it was Michonne who let Maggie in to see Negan, which to me says they would be on better terms, especially after the loss of Rick. Whatever drove them apart and drove the communities to have an agreed upon separation–Jesus and Aaron mention that they’re ‘breaking protocol’ by meeting and talking–has yet to be revealed to us, but man, it must have been a doozy and I’m very curious to know more. However, I also like that we’re getting it in pieces of the past like this while the story in the present day is about how they’re coming back together. I like that some members of each group are still communicating, protocol be damned, making sure that they don’t drift too far away. I like that when Rosita and Eugene are in danger, there’s no hesitation to work together to help out. And I really liked Luke’s story about how music and art are what bring people together and bring society to the next level, how it’s not superior strength and weapons that necessarily seal the deal on a group surviving long-term. I’m not familiar with the history he talks about, but the idea is something I can understand. We’ve seen many stages of survival on this show, from the individual to the familial to increasingly larger groups, going from a dozen or so members to entire small towns, at this point, and an interconnected society and group of such communities. We’ve seen the characters go from learning how to fight and forage to survive to learning how to farm and build increasingly complex machines. As their situations have developed and changed, their goals and their potential have changed as well. Things like art and music, which are part of our everyday lives, are luxuries that cannot be afforded to them. Who has time to pluck a guitar or paint a still life when you need to fight off walkers, possibly other humans, and also try to work a field all day so you and our family can eat? But things are changing once again for the survivors. They’re in a position to plan and host fairs, to make music and paint portraits and share stories. They can pursue goals that they choose–like Henry’s choice to learn to blacksmith. It’s also practical, sure, but the point is that he isn’t limited by what’s immediately available and necessary to where he is located anymore. These options have only arisen because of how the groups work together and depend on and trust one another, and the next step along that path is the ability to enjoy luxuries like music and art. Naturally, however, some people need more of a push to get there and feel safe enough to do so than others. Michonne is holding on tight to some sort of old grudge or betrayal, but when Rosita and Eugene are in danger, any feuds are forgotten for the sake of her extended chosen family. And it’s worth noting that for her love, it’s that fierce love and protectiveness that finally lets her bond and open up to Magna and Yumiko’s group. For Daryl and Henry, it takes Carol’s manufactured mini-crisis to get them to agree to work together, for her sake. Also, I’m loving the weekly reminders now that Carol is amazing. This week: how to set up a dangerous, but not too dangerous, trap to get your adopted son and your BFF to bond and agree to look out for one another! I was suspicious of this trap as being too obvious until Daryl mentioned that the traps were his design, but that Dog has never gotten caught in one before. It was well-done on Carol’s part, though–she was right there and ready to make sure neither of her boys got hurt, but it went well and net result was the outcome she wanted. I also enjoyed Henry’s mature point of view on the situation. He recognized that that this wasn’t just about him or Daryl, but also about what his mom wanted and needed for both of him and Daryl, even though they might not exactly love it. Which is enough of a push for Daryl to agree to come out of his self-imposed exile of searching for Rick’s body and living like a hermit. To me, this says that he was ready to give it up anyways or he would’ve pushed back on not going a lot harder. I also suspect that by morning he had figured out that Carol had set the whole thing up, given their conversation. His instantly relaxed greeting with Aaron and Jesus, and equally instant volunteering to help find Eugene. Seeing that group ride out together was like old times! Finally, at Hilltop itself, things are much like we expected: Maggie has left and joined Georgie, and Jesus is in charge now. He’s doing a good job, which isn’t surprising, and he’s well-liked, which isn’t surprising, and he’s restless with being in one place, which also isn’t surprising. Jesus was the one to slip out when Gregory was still in charge back in the day and he liked it for more reasons than just avoiding Gregory. He also avoided being in charge even when Gregory was around quite on purpose because he didn’t want to be stuck in one place and he didn’t want that responsibility, though he was aware that he probably could’ve taken leadership from him if he’d wanted to. But he’s a man of his word and he has a lot of respect for Maggie, so he’s done the job he said he would. His sneaking out to train with Aaron was very fitting for him, though. And damn, it’s been working out well, Aaron’s flying leap to tackle him from that horse was impressive! I’ll put it out there now that I expect Tara will end up as the official leader of Hilltop by the end of the season. And who knows, maybe this Aaron and Jesus friendship will move into more-than-friends territory? They are the only gay men (that we know of) in the region right now and they do appear to both be single…! An enjoyable episode with good developments for both the characters and the plot, which is always a winning combination for me! More reunions, more hints of what's happened, more hints of what's to come, but in a measured way--I'm find with not having gotten much more on the whispering walkers in this one, intriguing as they are. The development of the communities of survivors as they begin to reach a new stage, a new level of safety, is being represented well here. All the same it makes sense that not everyone is ready to take that next step, at least not without a push. Change is hard and its scary, even when what you're used to is itself hard and scary--but it's the devil you know. The newest additions are interesting and stand out from the others nicely, I think they're being incorporated well so far, and offering us new glimpses at the characters we already know so very well.